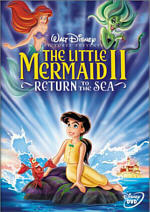 That started to change in 1990 with the release of The Rescuers Down Under. Some will argue it wasn’t a true sequel either, as it didn’t really continue a story. It presented some of the same characters but didn’t move along a progressing storyline. However one wants to view the semantics of the case, the fact remains that Down Under broke an apparent taboo at the studio. After that, they slowly became more and more enamored of sequels to their big-screen hits. Only two other than Down Under debuted in movie theaters: 2002’s and 1999’s Toy Story 2. But that’s the studio did. This started with 2001’s Lady and the Tramp II: Scamp’s Adventure - a sequel to the 1955 treasure – and Disney has started to raid the archives. In addition to Return to Neverland - intended as a DTV project but ultimately released theatrically - Disney has unleashed all sorts of sequels to older flicks. But on the other, I can agree with those who see the sequels as cheapening the originals. 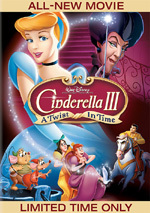 Rarely will that be more true than with the Disney DTV sequel, Cinderella II: Dreams Come True. An extension of the 1950 classic - one of the studio’s most revered gems - we find out just what happened to Cindy after Prince Charming took her away to live happily ever after. How did the picture and audio of this “Special Edition” compare to those of the original 2002 release? Both looked and sounded virtually identical. 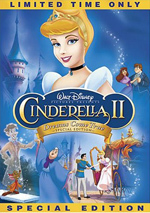 Though this set comes with the “Special Edition” appellation, the 2007 release of Cinderella II: Dreams Come True still packs a few very modest extras. In fact, it simply repeats the elements from the old disc and adds only a single new component: the Race to the Royal Banquet game. This offers three stages in which you need to guide various mice through obstacles. The first two levels are very simple, and the third is an annoying Dragon’s Lair style arrow-mashing irritation. None of these properties make it fun. Next comes Musical Magic, a five-minute and 53-second featurette about the movie’s score and tunes. We hear from composer Mike Tavera and pop singer Brooke Allison. Tavera provides a basic and kid-friendly discussion of movie scoring; it’s nothing illuminating for more experienced movie fans, but it should educate the target audience nicely. Allison’s bits are just fluff. We hear more from the singer in the music video for “Put It Together”. We don’t actually see her, however, as the three-minute and 52-second clip includes nothing more than snippets from Dreams. Lame pop song, boring video - skip it. Two Disney staples appear next. 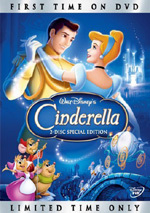 We get a Cinderella Storybook entitled “A Little Misunderstanding”. This piece focuses on Jaq the mouse and offers the usual option to read the story yourself or have the narrator tell it to you. Cinderella’s Enchanted Castle includes three very simple mini-games that might offer a few minutes of fun for the little ones. They did nothing for me. At the start of the disc, we get some ads. We find promos for Blu-Ray discs, WALL-E, The Aristocats, and SnowBuddies. These also appear in the Sneak Peeks domain along with clips for Underdog, Tinker Bell, Disney Movie Rewards and Phineas and Ferb. If dreams do come true, I’ll get to return to a happier time before I saw Cinderella II: Dreams Come True. While not an aggressively bad film, it seems excessively bland and lifeless, and it totally lacks the spark and life found in the original movie. Its 73 minutes plod by, as it never remotely threatens to entertain or delight. The DVD offers very good picture with decent sound and a weak roster of extras. I suppose some little kids who never saw the original might enjoy Dreams Come True, but anyone with fond memories of Cinderella should stay far from this poor piece of work. If you happen to disagree with me and you like Dreams, this DVD will be acceptable – if you don’t already own the original release. I don’t imagine too many viewers clamored for a Special Edition of this film, but those folks exist, they’ll feel sorely disappointed with this release. It adds almost nothing new to the old disc, so the “Special Edition” claim seems deceptive to me. The movie itself offers a cynical enough enterprise, and this pointless re-release makes matters even worse.